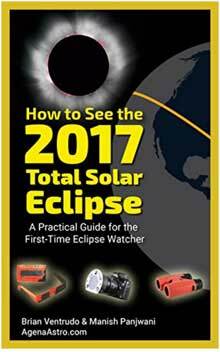 In May 2017, AgenaAstroProducts published its first e-book, How to See the 2017 Total Solar Eclipse. Written to help first-time eclipse watchers and casual stargazers prepare for upcoming eclipse in August, this book explains how to be in the right place at the right time-and with the right tools-to see this coast-to-coast total solar eclipse, the first in the U.S. in nearly a hundred years. The book is available on Amazon for less than four dollars. Scientifically, the total solar eclipse of August 21, 2017 is not expected to be more important than any other total solar eclipse. But it will be the first coast-to-coast total solar eclipse across the continental United States in more than 99 years. 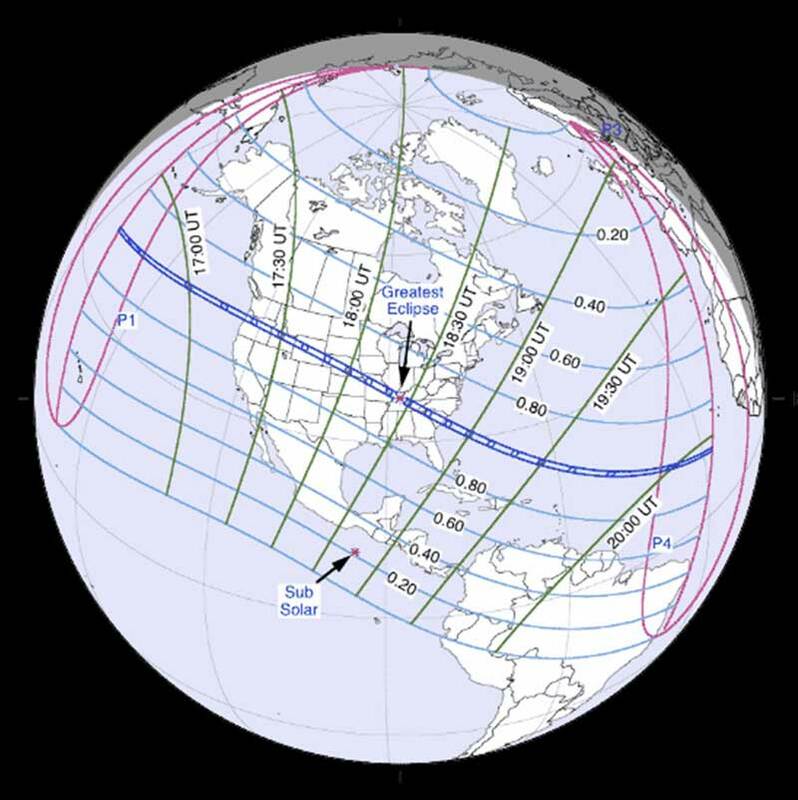 There has been no total solar eclipse visible at all over the continental United States since February 26, 1979, when the path of the Moon's shadow traveled across Washington state, Idaho, Montana, and part of North Dakota before moving northeastward into the provinces of Manitoba, Ontario, and Quebec in Canada. The last 'coast-to-coast' eclipse in the U.S. happened on June 8, 1918 when the Moon's shadow passed rapidly over the country from Oregon to Florida. Because of its location in a populous country, where more than 300 million people live within a day's drive of the path of totality, this will be perhaps the most watched astronomical event in history. The 'Great American Eclipse', as some call it, will give many sky watchers their best chance to see one of the most awesome spectacles in nature without the need to travel to a remote international location. The path of totality of the eclipse-the narrow band where the total solar eclipse will be visible-passes through Oregon, Idaho, a tiny edge of southwestern Montana, Wyoming, Nebraska, extreme northeastern Kansas, a tiny piece of southwestern Iowa, Missouri, southern Illinois, Kentucky, Tennessee, northeastern Georgia, North Carolina, and South Carolina. The penumbra, where a partial solar eclipse will be visible, passes across the rest of the United States, all of Canada, Mexico, and Central America, and northern South America. Figure 2-1: A map showing the narrow path of the umbra (in dark blue) where the total solar eclipse is visible, and the very wide path of the penumbra (in the grid of green and cyan), where a partial solar eclipse is visible to some degree during the eclipse of August 21, 2017. Image credit: NASA. The total eclipse will also pass over cities and large towns including Salem, OR, Idaho Falls, ID, Casper, WY, North Platte and Lincoln, NE, Kansas City, MO (barely), southern St. Louis, MO, Nashville, TN, and Greenville and Charleston, SC. Along the center of the path of totality, the total solar eclipse will appear to last about two and a half minutes. The eclipse will last longest, about two minutes and forty seconds, near Carbondale, IL and Hopkinsville, KY. The eclipse will occur on Monday, August 21, 2017 in the late morning and early-to-mid afternoon, local time, across the United States. It begins as the Moon's shadow falls on the north Pacific Ocean at 16:48:39 UT (Universal Time) or 09:48:39 Pacific Daylight Time (PDT) on the morning of August 21, 2017. The shadow makes landfall at 17:10:58 UT or 10:15:58 PDT on the Oregon coast, then speeds southeast over the continental United States for the next 93 minutes before moving over the coast of South Carolina into the Atlantic Ocean at 18:49:01 UT or 14:49:01 Eastern Daylight Time. The total eclipse continues into the Atlantic Ocean towards, but not reaching, Africa and ends at 20:01:35 UT, a little over three hours after it began. Note: UT is 'Universal Time', a standardized time used by astronomers. It is essentially equivalent to 'Greenwich Mean Time'. To convert Universal Time to your own time zone on a specific day, you can use the conversion tool at this link. Figure 2-2, provided courtesy of GreatAmericanEclipse.com, also shows the path of the eclipse across the U.S. 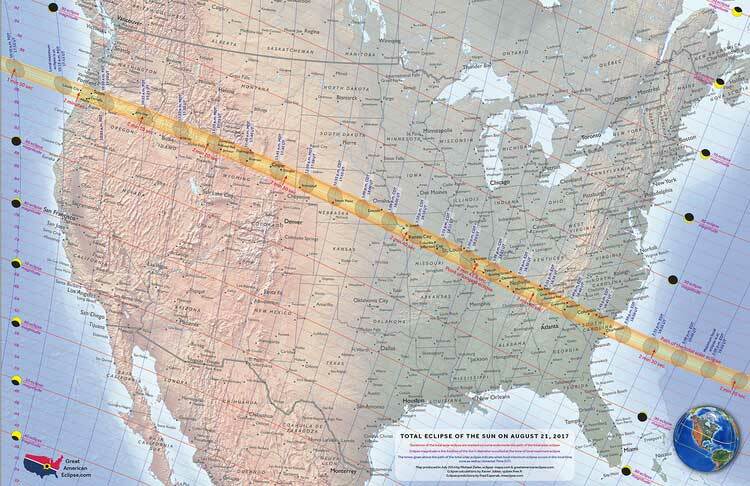 This website has more detailed maps of the eclipse path across each state at this link. Figure 2-2: The yellow band shows the path of totality across the United States for the solar eclipse of August 21, 2017. All of the U.S. will see a partial eclipse in which at least 70% of the Sun's face is covered by the Moon at maximum eclipse. Credit: GreatAmericanEclipse.com. Astronomers can calculate the timing and position of a solar eclipse down to the second and the yard, but calculating the weather at any particular position is a much more challenging proposition. It's frustrating to travel for hundreds of miles (or more) to see a solar eclipse only to get clouded out. Even on a mostly sunny day, a patch of cumulus clouds can float across the Sun at just the wrong time. But predictions based on historical weather patterns during late August in each state suggest some locations offer a better chance of clear weather than others. Figure 2-3 shows the statistical chances of morning and afternoon clouds along the path of totality from coast to coast. Figure 2-3: Morning and afternoon weather prospects for the total solar eclipse of August 21, 2017 along the path of totality. The best weather prospects are near Madras and Mitchell, Oregon. The least promising prospects are in the Blue Ridge Mountains and central South Carolina. Credit: Jay Anderson at Eclipsophile.com. While the place of first landfall of the eclipse, on the coast of Oregon, is a geographically beautiful location, the chances of mid-morning fog are quite high. At the other end of the country, in North and South Carolina and Kentucky and Tennessee, the chances of afternoon clouds are also greater than 70%. It's also hurricane season on the east coast and it tends to be quite humid. It may be a beautiful day when the eclipse happens in these locations, but the odds are against it. Figure 2-4: Mt. Jefferson, near Madras, Oregon, lies in the path of the August 2017 total solar eclipse. Image credit: Wikipedia. Most experienced eclipse watchers are planning on setting up in eastern Oregon in or near the little town of Madras. It sits at the intersection of four highways, allowing for last-minute movement to find the best sky if necessary. 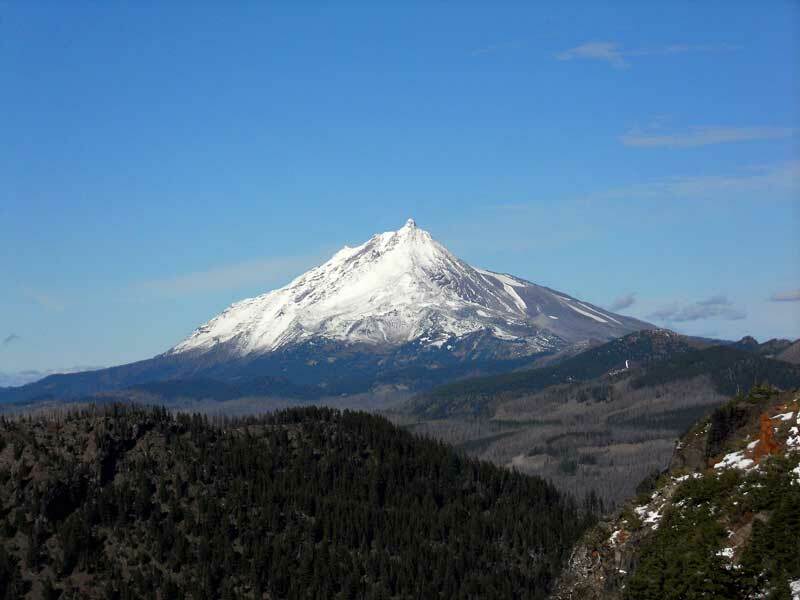 The cities of Salem and Portland have extensive lodging options and are just a few hours away. Salem itself sits in the path of totality, so it will be a busy place. Viewers in Portland will only see a partial eclipse. Madras is just east of the lovely stratovolcano Mt. 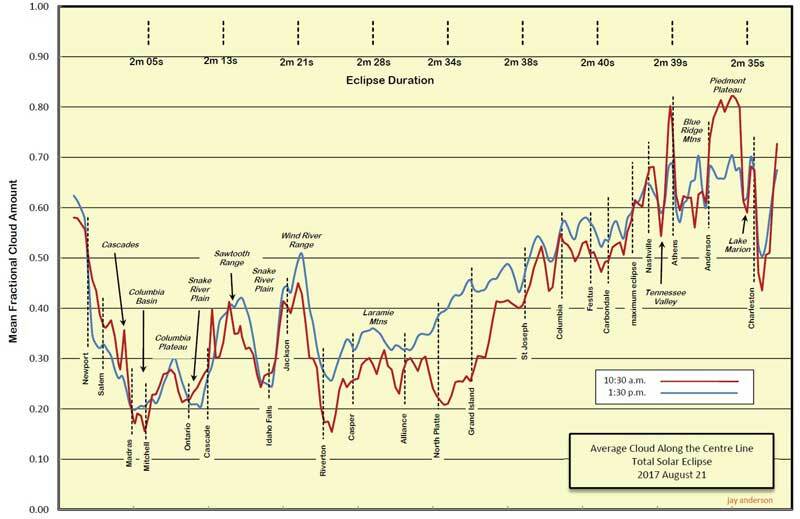 Jefferson (Figure 2-4), so observers will see the peak of the mountain darken 17 seconds before the Moon's shadow rapidly descends on the town. Some eclipse watchers and photographers looking for beautiful foregrounds in which to capture the eclipse will tryIdaho where weather prospects are good. In the eastern part of the state, Rexburg is a promising location. It's just north of Idaho Falls and offers good roads for mobility in case of last minute clouds. In the western part of the state, Highway 95 between Weiser (on the Snake River) and the Marin Creek Reservoir offers good odds for clear skies and totality durations of just over 2 minutes.Nearly smack on the centerline of the eclipse, Casper will be a popular place for eclipse watchers. Hardier souls and photographers may head to Grand Teton National Park in the western end of the state. For observers near the center of the country,Nebraska is a good prospect to consider. The path of the eclipse runs from the northwestern to southeastern tips of the state from 11:46 a.m. MDT to 1:09 p.m. CDT (Nebraska encompasses two time zones). Highway I-80 from North Platte to Lincoln will serve as a main artery for eclipse chasers who can use the good road network here to move towards better weather. On the I-80 just south of Grand Island, the eclipse lasts 2 minutes and 30 seconds. Moving east from Nebraska into Missouri, Illinois, and Kentucky, the chances for cloud cover increase, but many towns in these states-including Nashville-will organize events around the eclipse. Expect crowds in the larger cities and towns such as Nashville. Hotel rooms will be sold out months in advance. The Great Smoky Mountains National Park in North Carolina and Tennessee is a spectacular location to observe the eclipse, especially at high points such as Clingmans Dome where it may be possible to see the Moon's shadow moving across the surrounding landscape at more than a thousand miles an hour. Again, large crowds and the weather are the weak points here, and it may be difficult to maneuver out of the park at the last minute if the weather turns cloudy. Wherever you go, if you can, stay mobile so you can evade cloud cover on the day of the eclipse. Locations with access to highways offer that option. Trying to observe the eclipse from rural areas or parks may make it harder to get on the move at the last minute. Since the eclipse occurs in summer, you may want to travel in an RV or pack a tent and sleeping bag in case you need to travel hundreds of miles from your home or hotel room and can't make it back after the eclipse. Once you're in the path of totality and the weather looks promising, you need to find a place to sit or stand and enjoy the spectacle. There are tens of thousands of miles of open road from Oregon to South Carolina within the path of totality where you can pull over and see the event. Anyone can pull over off the road onto land that is governed by the U.S. Bureau of Land Management. There are also hundreds of towns each with areas or parking lots that can allow for great views. There will also be events organized in observing fields such as farms, parks, airports, and even stadiums. The website Eclipse2017.org is a great resource to find a location with an organized event. Figure 2-5: "The Road Atlas for the Total Solar Eclipse of 2017" by Fred Espenak. Road Atlas for the Total Solar Eclipse of 2017. 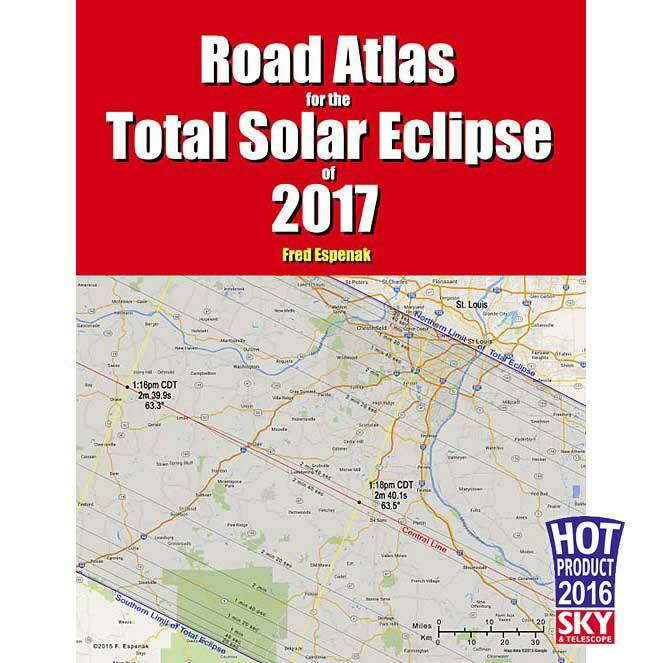 The retired NASA scientist and eclipse expert Fred Espenak has created a detailed road atlas to help you find the best places to drive to and see the 2017 eclipse. This atlas, considered by many to be the most authoritative of its kind, contains a comprehensive series of 37 full color maps of the path of totality across the USA. It shows both major and minor roads, towns and cities, rivers, lakes, parks, national forests, wilderness areas and mountain ranges. The path of totality on each map is depicted as a lightly shaded region with the northern and southern limits clearly identified. The total eclipse can only be seen inside this path. The closer one gets to the central line of the path, the longer the total eclipse lasts. Armed with the "Road Atlas" and the latest weather forecasts, you will be ready to chase totality no matter where it takes you along the 2500-mile-long path. A road atlas may seem like an anachronism, but it will be helpful for those who don't have GPS or map apps on their phone, or for those who do not have cellphone service in remote locations. 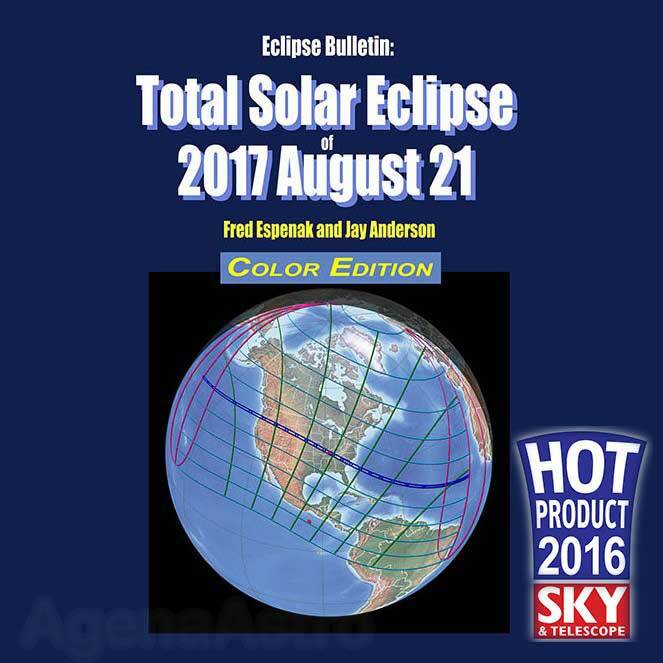 Figure 2-6: "Eclipse Bulletin: Total Solar Eclipse of 2017 August 21" by Fred Espenak and Jay Anderson. Manish Panjwani has been an active amateur astronomer since before Halley's Comet last flew by our neighborhood. A former wireless communications consulting engineer and management consultant to various Fortune 500 companies, Manish started Agena AstroProducts in 2003. Since then, Agena has become one of the leading online retailers of telescopes and astronomical accessories worldwide. Besides observing from his heavily light polluted backyard in Los Angeles, Manish enjoys conducting astronomy outreach programs in local schools. Manish also holds a Master's degree in Electrical Engineering from Virginia Tech and an MBA from the Kellogg School of Management at Northwestern University.